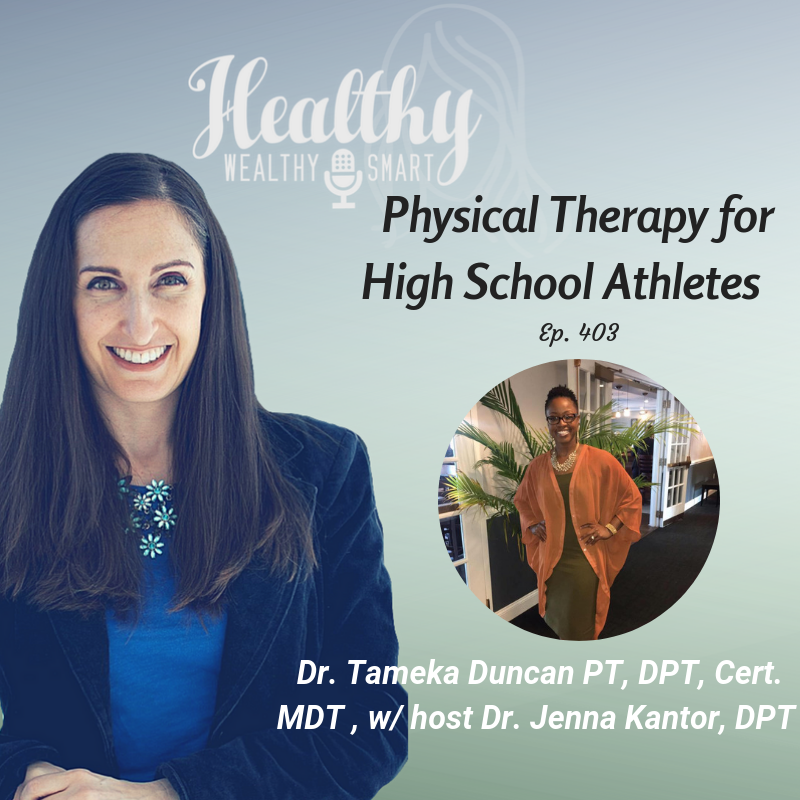 On this episode of the Healthy Wealthy and Smart Podcast, Jenna Kantor, DPT guest hosts and interviews Tameka Duncan on physical therapy for high school athletes. Dr. Tameka Duncan, DPT, Cert. MDT is a licensed physical therapist. It is one of her greatest passions to impact people’s lives daily through preventative and rehabilitative services by helping restore quality of life and improve overall function through physical therapy services. Dr. Tameka Duncan PT, DPT, Cert. MDT is a licensed physical therapist in Clarksville, TN. One of Dr. Duncan’s greatest passions is physical therapy. She loves fostering change through preventative and rehabilitative services. She takes great pride in helping restore patient’s quality of life and improving their overall function to return to the things they love doing most. Dr. Duncan attended Howard University in Washington, DC where she obtained her Bachelor of Science degree (2005) in Health Science with a concentration in pre-physical therapy. She later went on to attend the University of Maryland- Baltimore in Baltimore, MD where she obtained her Doctor of Physical Therapy degree (2010). Dr. Duncan has worked in a variety of settings throughout her practicing career. She spent 8 years in the outpatient orthopedic setting and recently transitioned to the home health setting, while starting her own mobile physical therapy practice, Vitality Sport & Rehab, LLC. Dr. Duncan’s area of specialty is treatment of the spine, to include both the neck and the back. Dr. Duncan obtained extensive training in the McKenzie Method of Mechanical Diagnosis and Therapy (MDT) obtaining her MDT Certification in January 2017. Dr. Duncan is also very experienced and enjoys treating various injuries sustained by the young athlete to the aging geriatric. In her spare time, Dr. Duncan enjoys spending time with her husband, her family/friends, working out, attending church, salsa dancing, mentoring youth, and spending quality time with herself. She loves fitness and has participated in several physique competitions. She is also a Beautycounter consultant, a skincare/makeup line that aims to get safer products into hands of everyone. Dr. Duncan best describes herself as a down to earth, outgoing, fun loving person that enjoys meeting and experiencing various people and cultures.